The year-round Pell Grant was a widely misunderstood federal program. Despite existing for just a few short years, it has garnered a reputation as overly expensive and poorly implemented. But these popular myths disguise the true story of a valuable program that fell victim to broader economic circumstances beyond its control and years of Congressional unwillingness to address funding challenges. 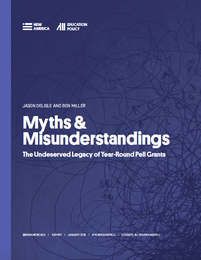 Those are the key findings from “Myths and Misunderstandings: The Undeserved Legacy of Year-Round Pell Grants,” published today by New America’s Education Policy Program. It sets the record straight on what happened to the year-round grant. The Pell Grant program helps millions of students from low-income families finance their higher educations each year with $32 billion in federal funds that support a maximum grant of $5,730 per student. Students can use the grants at virtually every type of school for a wide range of credentials, from certificates, two-year degrees and bachelor’s degrees. Today, however, full-time students cannot use the grants year-round, thanks to the way the Pell Grant program operates. There was a brief period when that wasn’t the case. In late 2008, as part of the reauthorization of the Higher Education Act, President Bush and a Democratically-controlled Congress made a common-sense change that let students who had exhausted their Pell Grants in a school year and wanted to take more classes, access additional grant aid. But in early 2011, President Obama and Congress ended this so-called year-round Pell Grant. Why? Many in the higher education community — including authoritative sources from Congress, the Obama administration, and the Congressional Research Service — will say it was because the program was flawed. Up until now, however, no one has examined those claims. To find out what actually happened, we carefully reviewed the history of the year-round Pell Grant, the statute and regulations that implemented it, budget statistics, and the rationales given for its elimination. We also interviewed experts inside and outside the executive branch and Congress. What we found was not gross incompetence, abuse, or ill-designed policy that many believed plagued the original program. The new paper scrutinizes common claims such as: students inadvertently received larger grants than intended; a year-round benefit shouldn’t increase the cost of the overall Pell Grant program; for-profit colleges abused the program; and the Department of Education botched the implementation of the program, diving costs higher. Ultimately, the paper shows that the year-round program was buffeted by the same forces that caused every other part of the Pell Grant program to rise in cost. And those forces coincided with decisions Congress had made that exacerbated funding problems with the overall Pell Grant program. Ending year-round grants became an expedient way to trim costs without sacrificing more visible parts of the broader Pell Grant program.